Cinematiq Eyewear: Designer Glasses that Connect Fashion and Cinema! 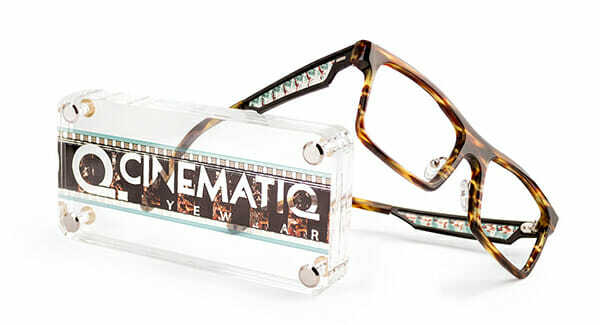 Vista Eye Care is proud to offer Cinematiq Eyewear. This new brand embodies a concept that connects the world of cinema with a pair of high-quality handcrafted designer glasses, but not simply by movie inspired forms, but literally by movie material, namely original 16 and 35mm FILM footage – and this indeed is revolutionary. Fists of the Double K (1973) – dir. Jimmy L. Pascual (and early assistance of John Woo). Both films have an abundance of outdoor scenes with natural lighting making them perfect for viewing with the naked eye. A special process of lamination preserves the delicate film before sandwiching it into a stainless steel frame. The selected scenes that appear in the temples are all different for each pair of glasses, never repeating, not even once. This makes all frames even more unique. But the story does not stop at this point: all glasses come with a so called ‘movie ticket’ with a link where the curated movies can be watched. From the designers’ perspective, it adds amazing detail to a pair of designer glasses. Each handmade spectacle “locks” real movie scenes into their temples. And from a movie-lovers view it is something very special to wear a piece of cinema history in a way that is modest, stylish and contemporary at the same time. Please stop by Vista Eye Care today to browse our complete Cinematiq collection. These eyewear pieces are truly one-of-a-kind!